Yasothon (Thai: ยโสธร, [já.sǒː.tʰɔ̄ːn]) is a town on the Chi River in the north-eastern region of Thailand. 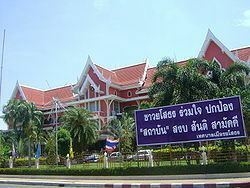 It is the capital and administrative center of Yasothon Province and seat of its City District. Within this district, subdistrict Nai Mueang (ในเมือง In town) comprises the bounds of the town proper, which had a population of 21,134 in 2005. It lies 531 km (330 mi) north-east of Bangkok, the Thai capital. In AD 1811/2354 B.E., Chao ("Lord") Racha Wong Singh (เจ้าราชวงศ์สิงห์ — Descended from Lions) more often transliterated Sing, led a number of people to landing on the River Chi, to found a town on a bluff by a deserted temple ground. Sing was a son of Chao Phraya Wichai (เจ้าพระยาวิชัยฯ) in the capital of Champasak (นครจำปาศักดิ์) The town was first called Ban Sing Kow (บ้านสิงห์เก่า Old Lion Village) or Ban Sing Tha (บ้านสิงห์ท่า). While there are numerous Khmer artifacts in and around the city, no written history is known prior to that year. Yasothon was successively governed by five Phra Sunthon Ratcha Wongsa: Singh or Sing, 1815–1823; Thao Sicha, 1823; Fai, 1823–1857; Thao Men, 1857–1873; Suphrom, 1873–1895. During the 1827–1829 Laotian Rebellion led by Chao Anouvong, Fai was active in encouraging left (eastern) bank people to migrate to establish their muang on the right (western) bank of the Mekong. King Rama III, in recognition of his achievements, also appointed him as chao muang of Nakhon Phanom, and he briefly governed both Yasothon and Nakhon Phanom. On 15 August 2011, in the Thai solar calendar month of Singhakhom (สิงหาคม,) a monument was erected in the city on the grounds of Wat Srithammaram, dedicated to Singh, the first Phra Sunthon Ratcha Wongsa. Rain fell heavily as the statue was raised onto its pedestal, but the sun broke through at 5 p.m. to smile on the dedication. The town's unofficial nickname is Mueang Yot Nakhon เมืองยศนคร Proud Capital. Chao Phraya Bodindecha (เจ้าพระยาบดินทรเดชา) (1777–1849), (personal name Singh or Sing, family Singhaseni (สิงห์ ต้นสกุลสิงหเสนี) was a chancellor (สมุห์บัญชี) and army general (แม่ทัพใหญ่) during the reign of Rama III (1824-1851). He led the army from Bangkok that put down the 1826–1828 Laotian Rebellion (ปราบกบฎ) of Chao Anouvong of Vientiane (เจ้าอนุวงศ์ เวียงจันทน์). General Sing then brought his army to Yasothon to rest. The campsite is now Wat Tung Sawang Chaiyaphum (วัดทุ่งสว่างชัยภูมิ field of bright victory,) featuring a nine-spire chedi. The chedi is open to the public; its north-east corner contains the golden image of a captive, and along the south wall is a Buddha footprint. During the Haw wars (ปราบกบฏฮ่อ) (1865–1890). Yasothon aided Bangkok in repelling Chinese invaders at Nong Khai. 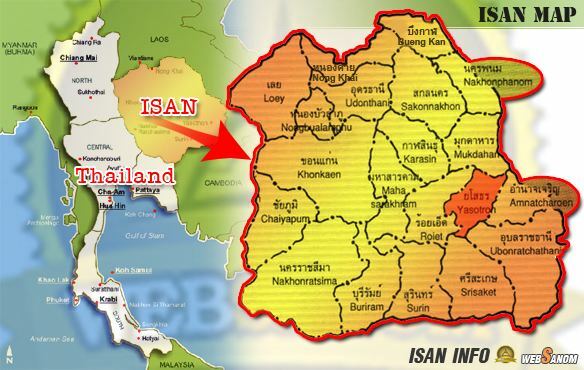 The local administration of Yasothon was created in 1944 as a subdistrict municipality. 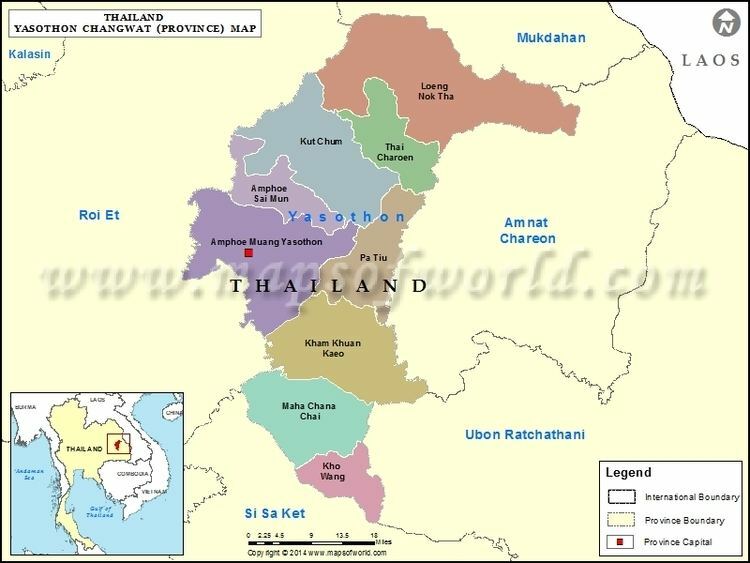 With the creation of Yasothon province, the municipality was upgraded to a town municipality. The city has a significant Thai Chinese influence. The city pillar, erected in AD 1987/2530 BE a short walk from Wat Singh Tha, is housed in a shrine (ศาลเจ้าพ่อหลักเมือง) that resembles a Chinese temple. A Chinese warrior impersonates the city spirit in the annual parade celebrating the Chinese lunar date of the shrine's dedication. 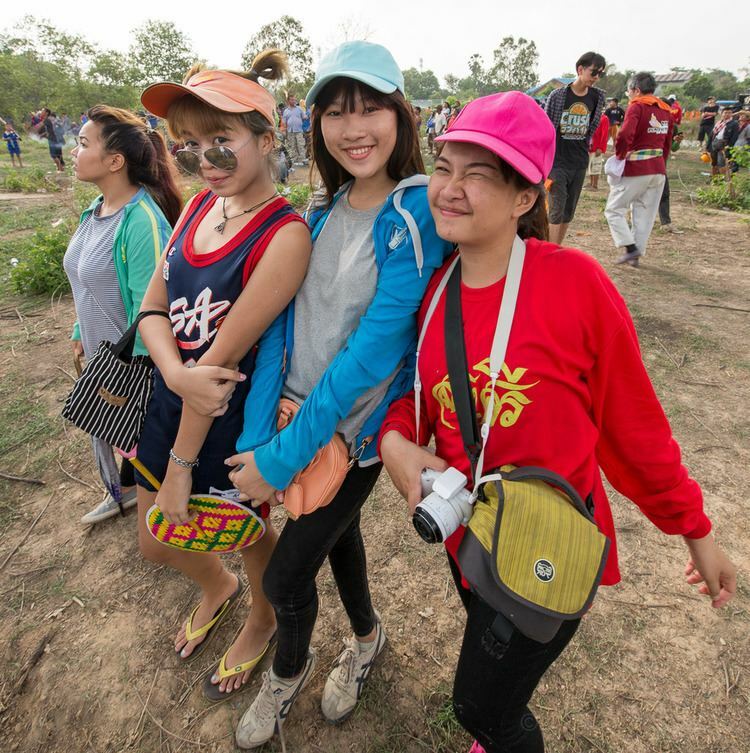 Yasothon's rocket festival ประเพณีบุญบั้งไฟ Prapheni Bun Bang Fai |Tradition of Boon of Bong of Fire) is held annually over the weekend that falls in the middle of the month of May. 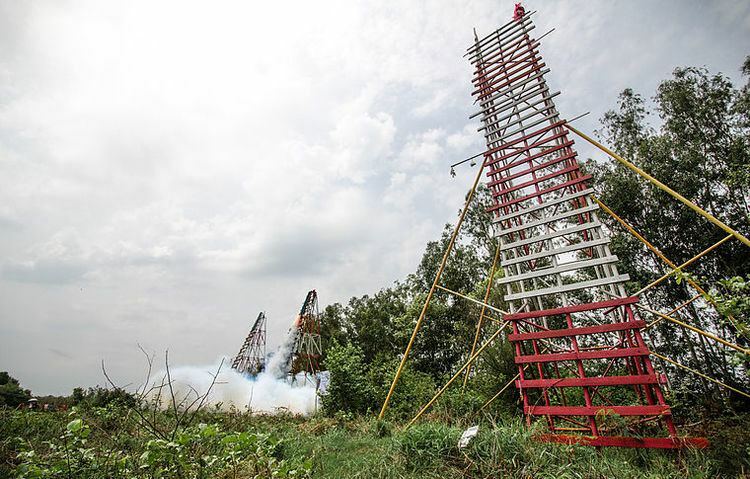 The festival's origins lie in a custom of firing rockets into the sky at the start of the rice-growing season to remind King of the Sky, Phaya Thaen, to send promised rain. The festival is a competition marked by a weekend of celebration, including highly decorated floats parading through the town, accompanied by partying, dancing, music, and a fair. Friday the main thoroughfare is transformed into a parade ground lined on both sides by concert stages, which will feature Mor lam performers throughout the night. Saturday sponsored parade groups compete for prizes. Many of the traditional dances and floats have to do with the legend of Phadaeng and Nang Ai, but others have to do with that year's particular theme. Sunday the action moves from the city center to Phaya Thaen Park at its eastern edge. The park is not only a beautiful playground with an athletic stadium and outdoor stage, it is also part of the city's flood-control project for those times when Phaya Thaen sends too much rain. The festival now takes the form of a competition to see whose rocket will stay aloft for the longest time. On May 10, 1999, the Yasothon Rocket Festival made world headlines when a 120 kg rocket exploded 50 meters above ground, just two seconds after launch, killing four persons and wounding 11. Phra That Anon – a Thai chedi or stupa over 1,000 years old, said to contain a relic of Ananda, a favoured disciple of the Buddha. An annual festival is held in March to honour the temple. Tat Thong is also an excavation site of a prehistoric settlement.